Oklahoma City dropped a close one against the Warriors last night despite 44 points from Russell Westbrook. The loss dropped them to sixth in the cutthroat Western Conference, a half game behind Salt Lake City and San Antonio. They’re now 1-4 over their last five games, all of which came against fellow Western Conference playoff teams. Trying to predict the final playoff seedings in the west is an impossible task right now, since teams four through nine are all within a game and a half of each other. The top three appear set, but everything after that is a mess, and the Thunder are sliding at the wrong time. It feels strange seeing the Thunder in sixth, even after the tumultuous campaign they’ve experienced. They have more talent than the Jazz and the Spurs. Russell Westbrook is the best player not on a top-two team, and he’s having another special season. (He needs 41 rebounds and 22 assists over his final three games to average a triple double again.) Steven Adams has never been better. So why are they behind two boring Western Conference teams who are both playing without their all-stars from last season? It’s not all Carmelo Anthony’s fault, of course. 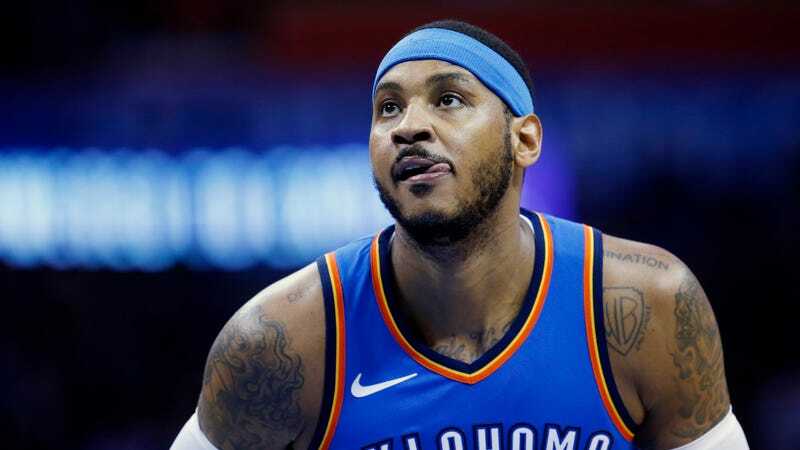 He’s not playing like the all-star he was last season and to expect him to would be to miss the point that his role on the Thunder is far different than it was on the Knicks. New York was a toilet carnival and he had carte blanche to shoot a million times. He came to OKC to win, which required him to acquiesce to Paul George and Westbrook and not serve as his team’s first option for the first time in his career. The problem with Anthony is that he’s floundered in his diminished role, and perhaps because he’s only ever been the first option on every single other team he’s played on, his efficiency has dried up as he’s gotten fewer touches. Melo has essentially been reduced to a stand-and-fire three-point specialist, which is really not what he’s good at, and he looks uncomfortable and adrift. George too has struggled at times with a lower usage rate and a steady diet of Westbrook-fed three-pointers, and last night he admitted that his shot mechanics are all boinked up. However, George is at least creating turnovers and eating at the rim. Melo is really only shooting from long distance. On its own, Anthony’s 35.8 percent clip from three-point range is not dreadful. It’s only a modicum below league average, and it’s actually better than Melo’s career percentage. However, NBA tracking data shows that most of his threes are open (with the closest defender four to six feet away), and he’s only hitting 30.8 percent of those, which is fifth-worst in league among players taking 2.5 such shots per game. Last night, he went 0-for-9, which is a career mark of sorts. Anthony, a career 34 percent shooter who’s only broken 40 percent once, is not exactly the ideal candidate for a late-career transition into a stationary shooter, but it’s what he’s been all year for the Thunder. He is not getting to the rim really at all, he’s barely taking any foul shots, and basically only ever passes to or receives passes from Russell Westbrook out on the perimeter. If you watch them play, Melo clearly seems out of place, and given the Thunder’s woeful bench output, it’s fair to ask whether OKC would prefer a bit more depth instead of an ineffective three-point specialist with a 12.7 PER who’s going to make $28 million next season when he’s 34. Most ominously for Anthony, Jerami Grant has presented himself as an intriguing crunch-time option, and his athleticism might be more useful for times when Westbrook takes over and shoots every single shot in the last five minutes. At this point in the season, this weird one-on-one Westbrook-centric team is who the Thunder are, and they’re not about to start passing a whole bunch or stop crashing the offensive glass. However, even for all of Melo’s struggles, they still seem like a tough out at worst. Their scant depth won’t matter as much in the playoffs. They still create the most turnovers in the league and snag the most offensive rebounds. You can bet that the Jazz and Spurs hope the Thunder stay far away from the 4 vs. 5 series, since they’ve played well against both teams this year and match up well with them. OKC could easily win a playoff series even if they have to play Portland (though the Blazers have beaten them four times this year), and that would be a fine achievement after an up-and-down season. But that’s not good enough, not for a team that swung for the fences and stands to lose Paul George one year after giving up the revelation of the 2017-18 season (Victor Oladipo) in exchange for him. You don’t rent Paul George to get swept by the Rockets or whatever, and you don’t trade for Carmelo Anthony to turn him into a traffic cone. The Thunder were expected to be the third seed and scuffle with Houston and Golden State, and though they’ll have a puncher’s chance since Westbrook remains God and he’s got actual stars around him, it does not feel seem like they’ll be able to mount a credible challenge against one of the west’s best teams. Not unless Carmelo Anthony turns back into a superstar and hits an ungodly amount of his threes, which, as this season’s evinced, he won’t. Oklahoma City&apos;s Wacky Corey Brewer Gambit Is ... Working? Carmelo Anthony After Russell Westbrook&apos;s Ejection: "I&apos;m Done With The Refs"